We have foxes. No not like pets. Mostly they just come onto our property and eat our chickens. Despite the fact that they eat my chickens, they are pretty darn cute. And my kids like to watch them. Since we have foxes, it is only natural that they LOVE "What Does the Fox Say?" My baby girl can even sing along to parts. (Never mind that my 4 year old knows the entire song. I blame my husband.) So I figured for this months FREE pattern, I would make a Fox Coin Purse. Just want the pattern and full tutorial and none of the hassel? Get it for download for just $2.50. No need to access the internet each time you want to make your own. Cut out your fox head pieces and apply interfacing to the wrong side of the fabric. 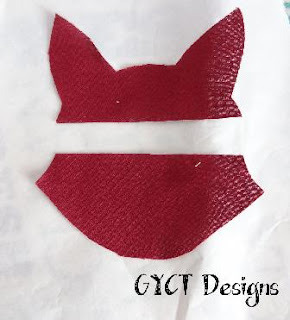 Trace the eyes, ears, nose and muzzle pieces onto fusible transfer paper. 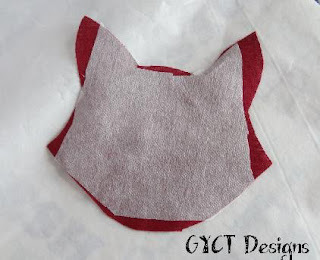 Cut them out and press them onto your fabric pieces. Then cut out each of the pieces. 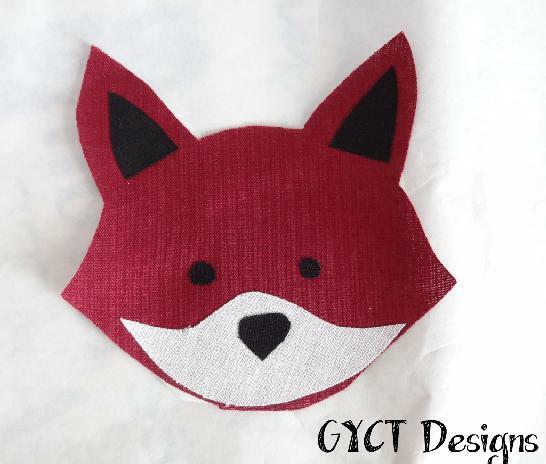 Transfer paper has a glossy sheen and can be fused to fabrics. Take your fox face front and place your ears, nose, ears, and muzzle pieces on the right side. Once they are where you want them, press them in place. Next, take your two head back pieces and your zipper. 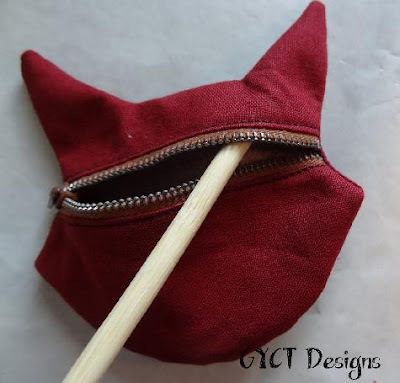 Unzip your zipper, and place one side on the straight edge of the bottom fox head. You'll want the teeth pointing down. 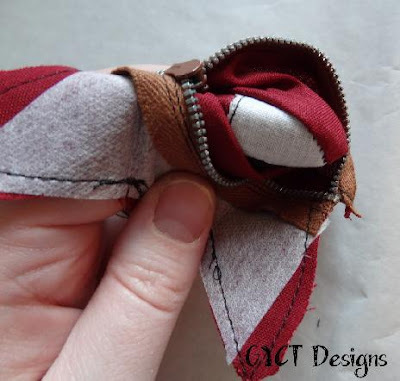 Stitch in place using your zipper foot. 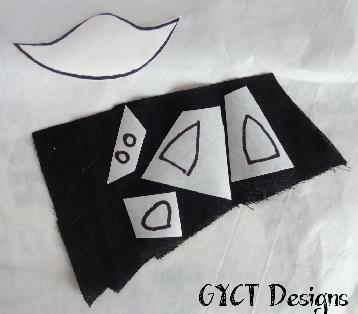 Repeat with opposite head piece and zipper. Once it is sewn on, press down the sides carefully! If your zipper is plastic it could melt under the iron. Next, topstitch down the head pieces to the zipper. As seen above. Now unzip the zipper half way. 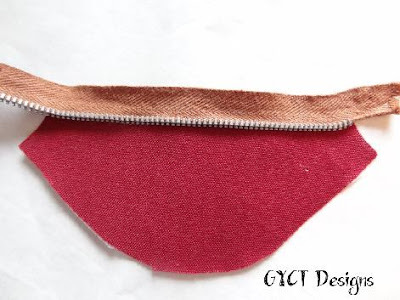 With Right Sides Together, put the head front and back pieces of the coin purse pattern together. Stitch around the two pieces. Clip around the rounded edges and at the pointed ears. Also, cut your zipper ends off. 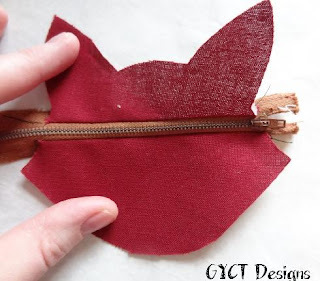 Only cut the part of the zipper that is outside of your stitching. You don't want all that extra bulk. 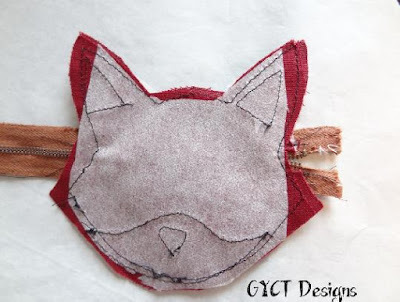 Pull the fox right side out through the zipper. Gently push all your corners and curves out. Press flat. Be careful again to not press your zipper if you used a plastic one. You don't want it to melt! 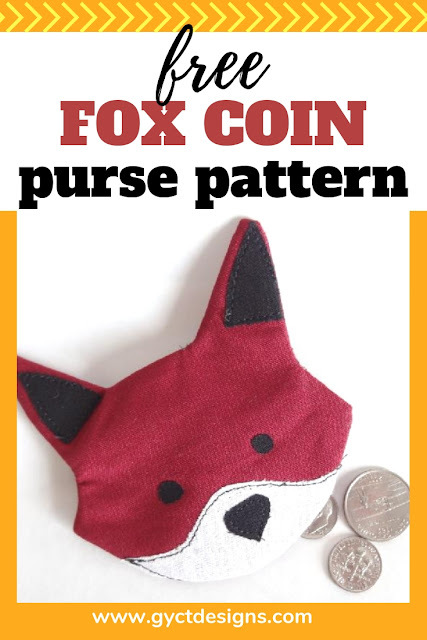 Now you have a cute fox coin purse pattern that you can collect all those coins in. 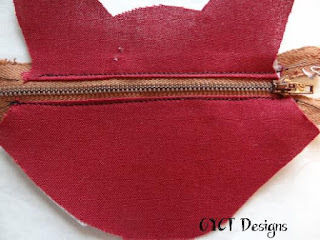 This makes such a great gift and is a great first zipper sewing pattern. 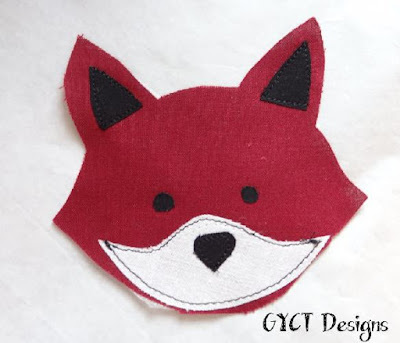 Can't wait to see all your great Fox Coin Pouches!